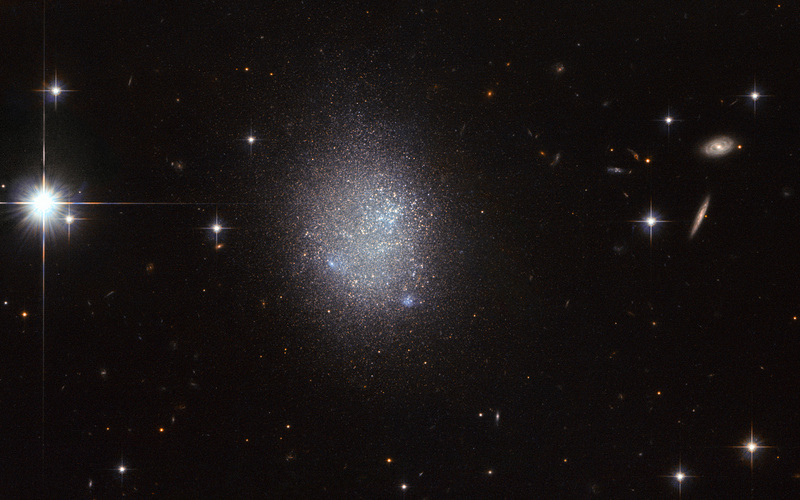 This NASA/ESA Hubble Space Telescope image shows a galaxy known as UGC 11411. 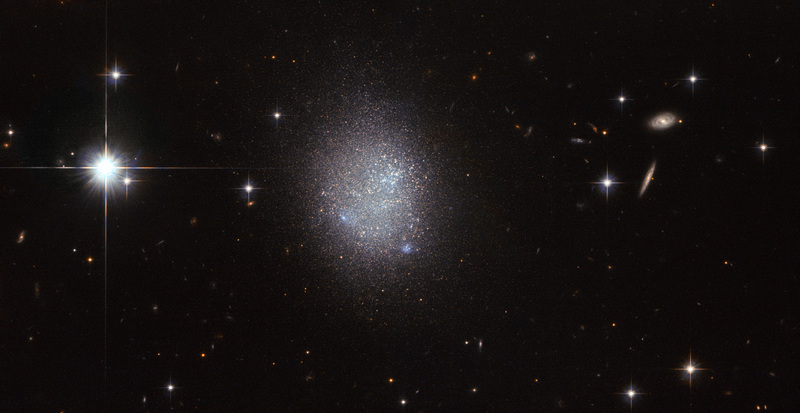 It is a galaxy type known as an irregular blue compact dwarf (BCD) galaxy. BCD galaxies are about a tenth of the size of a typical spiral galaxy such as the Milky Way, and are made up of large clusters of hot, massive stars that ionise the surrounding gas with their intense radiation. 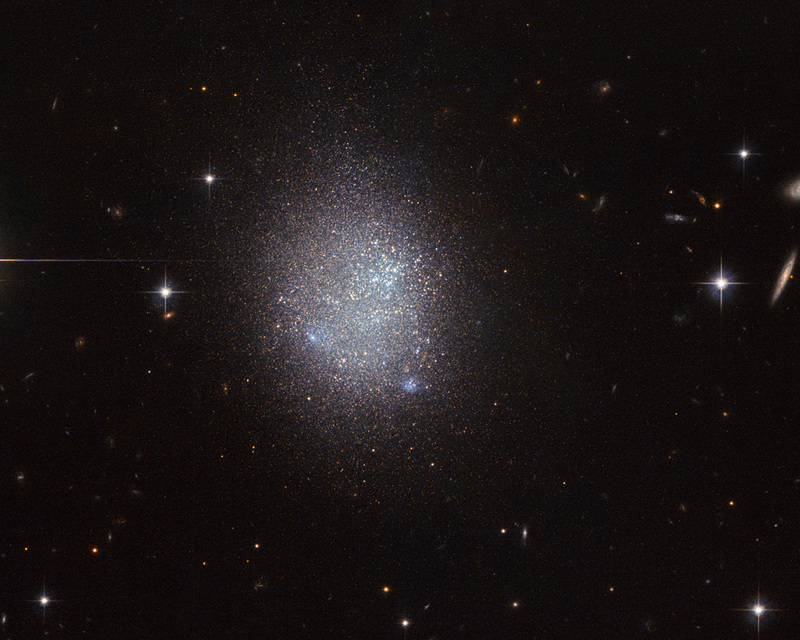 Because these stars are so hot they glow brightly with a blue hue, giving galaxies like UGC 11411 their characteristic blue tint. With these massive stars being less than 10 million years old, they are very young compared to stellar standards. They were created during a starburst, a galaxy-wide episode of furious star formation. 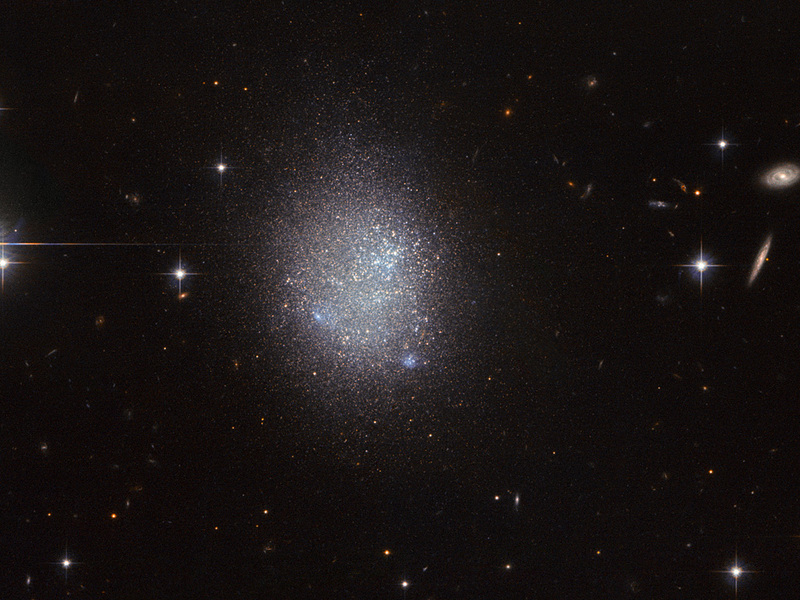 UGC 11411 in particular has an extremely high star formation rate, even for a BCD galaxy. Unusually for galaxies with such intense star-forming regions, BCDs don’t contain either a lot of dust, or the heavy elements that are typically found as trace elements in recently formed stars, making their composition very similar to that of the material from which the first stars formed in the early Universe. Because of this astronomers consider BCD galaxies to be good objects to study to improve our understanding of primordial star-forming processes. The bright stars in the image are foreground stars in our own Milky Way galaxy. Position (Dec): 70° 16' 58.38"